We don’t mind watching conflicts and brawls in our Hindi movies and shows, right? But what happens when the off-screen angst gets intense and brawls ensue in real life? 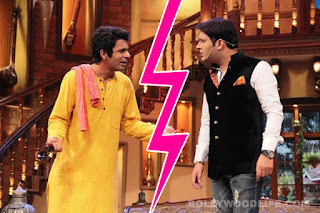 Well, Kapil Sharma’s recent fight with Sunil Grover shows what it can turn into. For the uninitiated, Sharma, who was returning from Melbourne and Sydney after performing a stage show, got into an ugly scuffle with Sunil Grover. Kapil suddenly walked up to Sunil and allegedly hurled abuses at him. While had Kapil posted a message about the incident on his official Facebook page, Sunil Grover has now used Twitter to express his opinion. Sunil grover Tweeted on Kapil alleged fight with him .Sunil grover is deeply hurt from the Kapil Sharma Show host kapil.Rad All that Sunil has to say to kapil..
Bhai ji , yes you hurt me deeply .Working with you has been a learning experience just one advice start respecting human beings also apart from animals .All are not as successful as you are.All are not as talented as you are.But if they all are talented like you , who will value you .,So , have some gratitude towards theri existence .And also , if someone is correcting you , don't abuse that person.Refrain from using foul language in front of women who have nothing to do with the stardom you carry ,they are by chance just travelling with you .Thanks for making me realise it was your show and you have power to throw out anybody,anytime.You are the wittiest , and the best in your field .But don't act like a 'God'.take good care of youself. Wish you lot more success and fame.